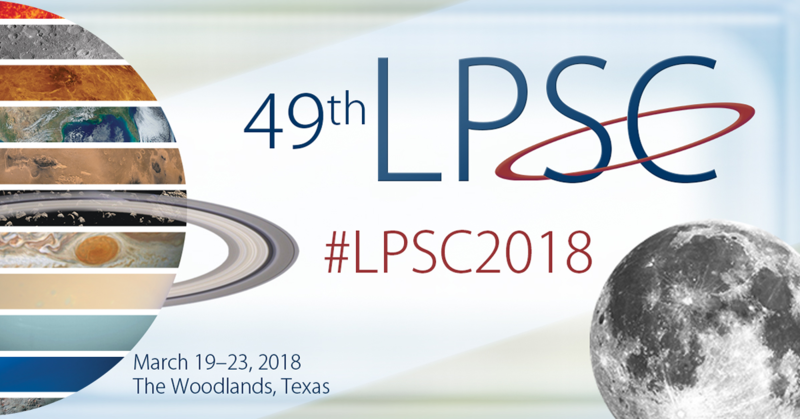 I had the fortune of being able to attend, and even present, at the 49th-annual LPSC (Lunar and Planetary Science Conference) last week, in the Woodlands, Texas (a suburb of Houston). I really only did two things at LPSC: Listen to various people talking about various planetary science-related things, and look around at the numerous posters and booths stationed there also pertaining to various planetary science-related fields. I did also present a poster myself, on the Thursday, and I grabbed a bunch of quality maps and pens from the booths while I wasn’t talking to a passerby about potential factors driving melt emplacement on Mercurian craters and, by extension, lunar and Venusian (and potentially other worlds) craters. A thank you to C. Leight and L. Ostrach for the abstract characterizing impact melts on Mercury, since I’ve been doing a lot of looking at Mercurian crater melts recently–and thanks to Dr. Neish for pointing this abstract out to me (since I managed to just miss the talk itself… D: )! A special thanks to Josh for helping out with some of the cost…. Another big chunk of my thesis came due for supervisor revision this week, too. It’s amazing how much time I thought I had, but didn’t, to work on my first two chapters! CPSX “Space Day 2018” is also this Friday, but at least this time I have a good poster already made for it. Yeah! Also, Easter and April Fools falling on the same day…?! Fancy that! That’s all I have for now. Good day!